Note: This is a fictitious company. Actual reports may not include all information seen in these samples. Click on a numbered image below for more details. Ultimate Parent National Food Service, Inc. The objective of the Supplier Evaluation Rating is to predict a company's relative financial strain. High Risk means there is an increased probability for business disruption or failure. Low Risk means there is a good probability of business continuation. • Percent of active commercial accounts. • Number of delinquent commercial accounts 61 plus days. 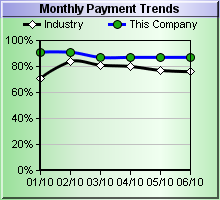 *Percentage of on-time payments by month. 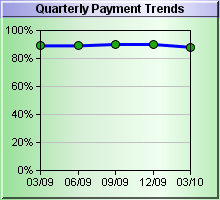 *Percentage of on-time payments by quarter. * The information herein is furnished in confidence for your exclusive use for legitimate business purposes and shall not be reproduced. Neither Experian nor its sources or distributors warrant such information nor shall they be liable for your use or reliance upon it. © 2019 Experian Information Solutions Inc.